When you’re known as the First Lady of Celtic Music and you live on an island so rich in sonic heritage, you can imagine how full your dance card can get. That’s the case with Moya Brennan, sister of Enya, lead singer of Clannad, and partner in an endless parade of projects. “I think I’m getting worse in terms of getting involved in too many things,” Brennan says with a laugh. “ I love music and I just love getting involved in this. 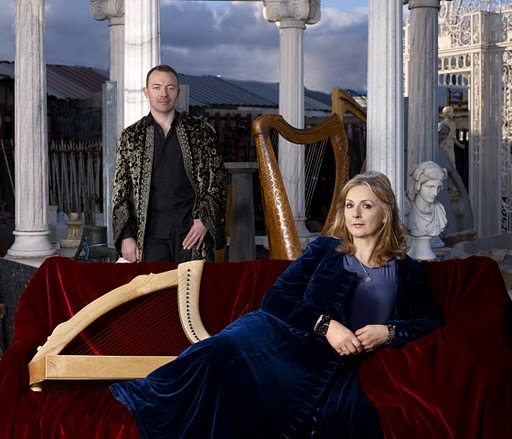 Her latest project is Harps and Voices, a gorgeous collection of songs driven by the brilliant harp work of Cormac DeBarra, a member of Brennan’s touring band and a much-sought after producer and player that has worked with the likes of Ashley Davis. The intoxicating combination of Brennan’s ethereal voice and phrasing with the rich tones of an Irish harp is sheer joy. “She Moved Through the Fair” and “The Streets of Derry” are just some of the gorgeous songs on Harps and Voices. “Cormac and I have been working together for seven or eight years,” she says. “He’s the best Irish harp player without a doubt and we’re just such pals. We started to work in my studio and before we knew it, we had an album. Harps and Voices comes on the heels of Brennan’s album with T with the Maggies, a collaboration with Altan’s Mairéad Ní Mhaonaig and other traditional singers from Donegal. “It is great fun -- it’s a miracle we get any playing done because we are so busy laughing,” Brennan says. “We know each other since the seventies and it’s amazing that we haven’t done anything sooner. Myself and Mairead from Altan are busy so it’s hard to get together. Harps and Voices is not just a winning CD, it’s also an educational movement and celebration that Brennan has spread to Ireland. She and DeBarra recently hosted a workshop and invited the public to Donegal to partake in lessons and collaborations with harpists and vocalists. “We just had 10-15 people to keep it personal,” she says. “It’s a lovely idea to work with the songs. We had seven harps up on the stage and it was a magical moment. Some wanted harp and some wanted just the voice. Brennan will be coming to our shores in the coming weeks and will make stops at places like the Dublin, Ohio and Milwaukee Irish Festivals and will be joined by both DeBarra and her daughter/guitarist Aishling. For details on where these concerts will take place, log onto www.moyabrennan.com. As if that weren’t enough on her plate, Brennan reveals that she’s gotten the old band back together, so you can call off those prayers for a Clannad reunion! “I’m recording a Clannad album at the moment,” she says nonchalantly. “We keep saying we’re going to do it. We did a special event in January for a trad fest in Dublin. We were only meant to do one but it sold out in a few minutes so we added two more and the shows were just brilliant. Can’t wait to hear some new Clannad classics!